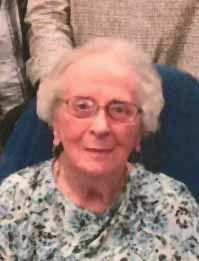 G. Arlene Felton, 92, of Everett, a lifelong resident of Breezewood, was called home to be with the Lord on Sunday, April 14, 2019. She was born Thursday, May 13, 1926, at her family home in East Providence Township, a daughter of the late Dewey Jay and C. Marie (Williams) Jay. On April 2, 1945, in Hagerstown, Md., she married William G. “Bill” Felton who passed away on Oct. 10, 1989. She is survived by their children: Bonita A. “Bonnie” Shaffer and husband, Dennis P. Shaffer, of Millersville; Daniel L. “Danny” Felton of Altoona and companion, Tracey, of Altoona; a daughter-in-law, Rebecca (Carroll) Felton of Hollidaysburg; a brother, Eugene Jay of Hermitage; a granddaughter, Jennifer Shaffer Harris and husband, Robert Harris, of Quarryville; and two great-grandsons, Cole and Brook. In addition to her parents and husband, she was preceded in passing away by an infant sister, Sarah Ellen Jay; a sister, Naomi C. Whisel; and two brothers, Richard Jay and David Jay. Mrs. Felton was a lifelong member of the Wesley Chapel United Methodist Church, where at the young age of 14, she began playing piano and organ for Sunday services. She attended the Woodbush School near her childhood home and was a graduate of Everett High School, Class of 1945. Never one to sit still, Arlene was a homemaker who also worked as a cook at Alwines Restaurant and at the Wildwood Restaurant in Breezewood, worked as a private housekeeper and as a housekeeper at the Penn-Air Motel, was a member of the Memorial Hospital of Bedford County Auxiliary where she operated the Snack Bar, and was a representative for Modern Woodmen of America. Funeral service will be Wednesday, April 17, at 11 a.m. at Wesley Chapel United Methodist Church, with Pastor Patrick Traxler officiating. Friends may call at Dalla Valle Funeral Service, 22 West Main Street, Everett on Tuesday from 4 to 8 p.m., at the Church on Wednesday from 10 a.m. until the hour of service and share memories online at www.dallavalle-everett.com. Burial will be held at Mt Union Cemetery.